Linking design, sustainablitiy and the community. An exciting calender event for My Patch has been the My Patch My Connected City workshop for Federation Square and held in the Edge Theatre as part of their May 2013 Education Week program (supported by the Department of Education and Early Childhood Development). Run as a single day – two workshop event for school groups, this My Patch focused on the importance of communications (connectivity) in design, building communities and good environmental practice. 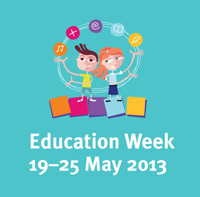 Artillery is proud of this association with Federation Square and Education Week and hope to develop similar collaborative programs in the future.